My braising obsession continues to grow. I simply love the fact that you can get extremely delicious dishes with such a simple technique. 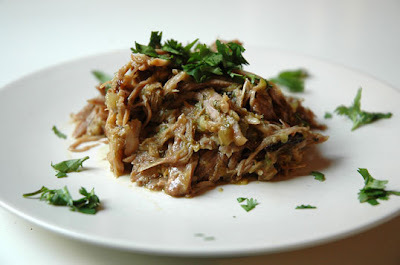 I’ve made this Salsa Verde Pork Shoulder twice now and I still think it is one of the best braising recipes I’ve ever tried. I made this yesterday for a potluck lunch at Michael’s work, and by the look of the empty tupperwear container, I think Michael’s co-workers liked it! Trim excess fat from pork shoulder. Heat 1 tsp of olive oil in heavy cast iron dutch oven. Place pork in hot oil and sear each side until all sides have a nice, crisp, brown sear. Add onions and sweat for a minute. Add salsa, cumin seeds, coriander seeds, oregano and broth. Bring to a boil, reduce heat, and cover. Simmer until meat is very tender and falls off the bone, about 4 hours. After meat is done braising, take pork out of dutch oven and place in baking pan. Heat over to 375 degrees and bake pork for 30 minutes until richly brown. Once brown, place in broiler for an additional 3 minutes to make outside charred and crispy! While pork is baking, skim salsa verde sauce of all excess fat and oil. Once pork is done crisping in broiler, tear pork apart with two forks and place back in salsa verde sauce. Add salt to taste and add cilantro and serve immediately. I have been researching this kind of recipe for so long! And it’s been turning out better and better – but I just made it with cherries, and used your broiling technique. Thanks a million – the cherries end up caramelized with pork fat…it’s very yummy! Thank you for the missing part! !